Many may not know this but what we know today as the White Swiss Shepherd, or the Berger Blanc Suisse, was previously known as a German Shepherd. And you can still find white German Shepherds today being bred and registered as German Shepherds. 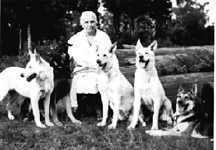 Below is the history of how the white German Shepherd became the White Swiss Shepherd. Many do not know that the color white is one of the original colors of the German Shepherd Dog (GSD). 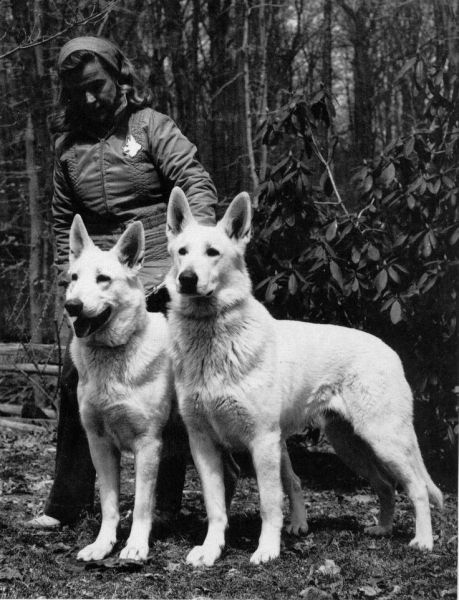 Max Von Stephanitz, the person who created the GSD breed, owned several white GSD. Hektor, the first registered GSD grandsire, Greif, was white. Ann Tracy's Stoneihurst Edmond, who was whelped in March 27, 1917, was the first registered white GSD who was born and bred in the United States. You can see a picture of her to the right. 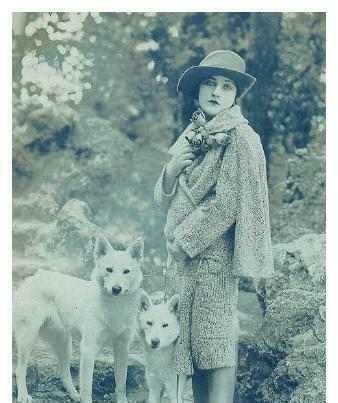 Above is a picture of Geraldine Rockefeller Dodge who had a great love for the GSD breed and especially for the whites. The white color became a disqualification in the GSD Standard by the German Shepherd Dog Club of America over 45 years ago. Before that time the white GSD also competed in conformation events along side its colored counterparts. This removal of being able to show in the AKC show ring mainly came about because of rumor that the gene that caused the coat to turn white also lead to all the sever health issues or fading colors of the breed overall. Scientific testing in the past 20+ years has disproven all these claims as the gene that causes the white coat is in fact a masking gene only. It does not affect health in any way. The Canadian Kennel Club(CKC) followed in the AKC footsteps and stopped allowing white GSD's to compete in conformation starting in 1998. The white GSD can still be registered with the AKC or CKC as a German Shepherd but because of the color disqualification, they can not be shown in the AKC/CKC conformation ring. Which is one of the main reasons white GSD fanciers wished for breed seperation. So that they could enjoy the same rights that the colored GSD fanciers enjoyed. There are many falsehoods that still exist today about the genetics of the white gene in the White Swiss Shepherd(WSS), white GSD. Some like to say it is an albino trait or that it causes deafness or blindness. Other say it is the cause of fading or health problems. All this has been proven to be untrue. Many of the falsehoods about the WSS happened before modern genetics research. Even though these rumors have been proven to be false, the rumors have been hard to correct in the eye of the public or those who have been in the GSD breed a long time. The falsehoods about the WSS/white GSD and the gene that causes their coat color are many. First they are NOT albinos. Albinos have no colored pigment and usually pink eyes. The WSS/white GSD have brown eyes and black pigment on their noses, mouth, paw pads, eye rims,sometimes a black dusting in their ears and sometimes have darker skin and nails. Color paling was another rumor that has since been proven false. The white gene is a masking gene, not a dilute gene (such as liver and blue). A masking gene hides the real color and pattern of the dog. A white GSD/WSS can be any color found in the GSD like black, black and tan, black and red, black and silver, black and cream, blue, liver, sable, saddled and bi-colored. The only time dilution could occur is when a WSS/white GSD is masking a diluted color like blue or liver. The white gene is a recessive gene. The only thing the gene expresses is coat color. It does not cause poor health, temperament or any other issue or concern. In the 1968 the white color became a disqualifying fault in the GSD standard determined by the German Shepherd Dog Club of America. Before this happened, the white GSD was able to compete with its "colored" counterparts in the AKC conformation ring. The white GSD can still be registered as a GSD by the AKC and can still participate in AKC performance events. But regardless of disproving the concerns that led to it's removal from the show ring, it has yet to be allowed to show once agian. For over 30 years, white GSD fanciers worked to change the GSD standard to allow them to once again show in the AKC conformation ring. This has not worked. And shows very little chance of actually coming about. Hence the reason for breed seperation. In the UKC the white GSD can be registered as a GSD or a White Shepherd. And they do allow them to compete in conformation. Also the FCI, an international registry, has allowed for the seperation of the white GSD. It is now known and FCI registered as the White Swiss Shepherd or the Berger Blanc Suisse. UKC allows FCI registered WSS to be registered as White Shepherds. This is how our dogs are registered here in Canada as the Canadian Kennel Club has followed the example of the AKC when it comes to not recognizing them as a seperate breed. So will not allow an FCI registered WSS to be registered at all. Some day we hope this will change. WSS can perform in and excel at performance events like obedience, tracking, agility, flyball and herding trials. They can be police dogs, bomb detection dogs, drug detection dogs, and Search and Rescue dogs just to list a few. They are also great family pets, service dogs for the disabled, farm dogs, therapy dogs, and they have also apeared in many movies and tv shows. The ablities of these dogs have no end.